The liver is a particularly squishy, slippery organ, prone to shifting both deadly tumors and life-preserving blood vessels by inches between the time they’re discovered on a CT scan and when the patient is lying on an operating room table. Surgeons can swab the exposed liver lightly on the surface with a special stylus, capturing the shape of the organ during surgery, and a computer can match that image with the CT scan on a screen. This GPS-like ability is far better than guessing where the tumor and vessels are by feeling for them, but even this road map can be off by centimeters. Vanderbilt University’s Michael Miga, Harvie Branscomb Professor of Biomedical Engineering, and his team published the potential solution: surgery-tested software that better marries the CT scan’s image with the tracked tool’s. It’s an advance that stands to help more than a half-million liver cancer patients worldwide each year. Their paper, “Deformation Correction for Image Guided Liver Surgery: An Intraoperative Fidelity Assessment,” appears this month in the journal Surgery. Used in a blinded, randomized 20-patient bystander study over the past two years at Memorial Sloan Kettering Cancer Center in New York, surgeons said the new technology improved the registration in more than 70 percent of cases. “Deformation happens,” said Miga, who developed the Pathfinder stylus system for abdominal surgeries. It sold to Analogic Corporation in 2014 and is in use at top cancer centers. The trick to fixing that error without investing in additional expensive equipment is software that makes a computer model out of the original image of the liver and simulates the forces being applied during surgery — such as packed gauze lifting the liver upward. The computer adjusts the CT-derived GPS map to better match the exposed organ shape in the OR. In the study, surgeons were shown six or seven CT images, depending on time, for each of 20 liver tumor patients in the operating room, for a total of 125 images. The CT map would either be aligned to the original Pathfinder or Miga’s new enhanced CT map that corrected for deformations. The surgeon was not told which display was being presented and would assess the alignment by touching the stylus on the patient’s liver and looking at the display. The surgeon would then provide a score on a scale of +3 to -3 relative to the previous display presented. The display order was randomized and could go from enhanced to original, original back to enhanced, or held constant. The surgeon was able to detect the variations correctly in 73 percent of the 125 different evaluations. 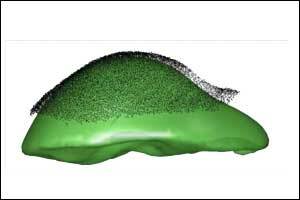 This new deformation correction technology is available to be integrated into image-guided surgery systems.